If you have your heart set on marrying at a particular venue, you’ll need to check their availability early on. Many traditional wedding venues book weddings 12 to 18 months in advance, though non-traditional venues may be more flexible. While the most important people at your wedding are you and your spouse-to-be, you’ll want to ensure you pick a date on which all or most of your VIPs are available. Is one of your cousins getting married on the other side of the country? Don’t pick a date too close to that event or you’ll be competing for guests who have to take time off work to travel. If you want to work with a popular wedding photographer, you’ll need to get in touch with them soon after you begin your wedding planning to check their availability. Be flexible, though, and know that there are plenty of great photographers out there if you just can’t nail down your first choice. 9 Health of the marrying couple and family members. If there are ongoing health issues affecting you, your spouse-to-be or members of your family, you’ll want to take that into consideration when setting your wedding date. Do you need to marry sooner rather than later on account of an ailing grandparent? If so, be flexible with your date and accommodate those who matter most to you. There are pros and cons to marrying on or near a holiday. On the one hand, if you marry around a holiday like Christmas, your friends and family may have traveled back home already and no extra travel costs are required. On the other hand, families are often very busy around Christmas and food and venues prices shoot sky high. Some venues also book up quickly around the holidays for family gatherings. 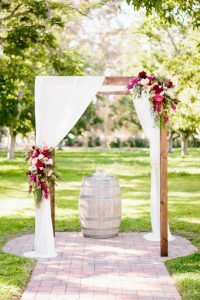 But tying the knot around a holiday like Labor Day, however, can be a boon for marrying couples: You can often get a better price on a venue on a Sunday, and your guests won’t have to take extra time off work over the long weekend. Plus, attending a wedding on a long weekend is a nice excuse for a little getaway.